About | Artbar Tokyo – Paint and Wine Studio: Let Your Creativity and the Wine Flow! 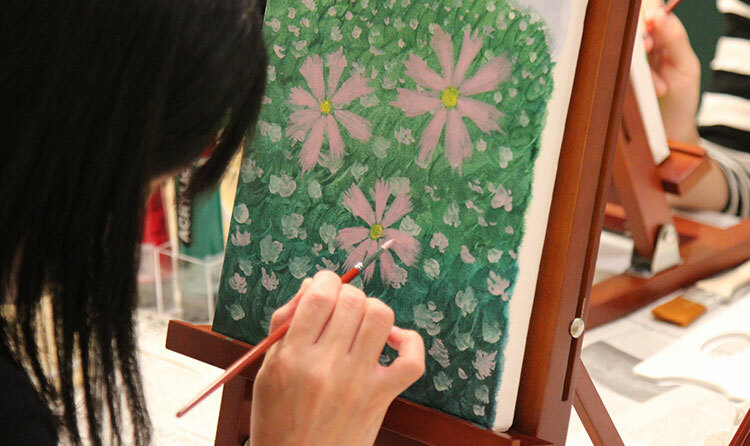 About – Artbar Tokyo – Paint and Wine Studio: Let Your Creativity and the Wine Flow! Our modern studio in Daikanyama has everything you need to enjoy an instructor lead painting session complete with wine and snacks. Come relax with our friendly group of instructors in either English or Japanese, with new events and collaborations added weekly. All you need to think about is where you will hang your masterpiece. Artbar painting sessions are for the art enthusiast — from beginner to expert we make it fun for all. No prior art experience is welcomed and encouraged. Simply sign up for a painting session based on your preference and schedule. Everything is ready to go. Arrive as you are! Grab a drink and some snacks. It’s time to relax! The instructor will explain the event’s painting, and get you setup. Pick up your brush and leave your busy day behind you. Take a step back and walk around. We are all friends here! Take a photo of all the assembled paintings, and pack yours up to go! Very fun and relaxing! It completely took my mind off my extremely busy days in Tokyo. Ami, our instructor, was easy to follow, and when I needed help she was right there for me. So much better than the usual Thursday night options! I’ll be back, and hope to meet you there! Create your masterpiece with ArtBar.